The toll of violence in Mexico is usually counted in terms of the human and emotional cost, but as organised crime groups get rich on the suffering of others, the financial damage to the economy is also considerable. According to the latest Mexico Peace Index , the total economic impact of violence in Mexico in 2015 was 2.12 trillion pesos (US$134 billion), around 13% of the country’s GDP. To break the figures down, that’s the equivalent of 17,525 pesos (US$1,105) per Mexican citizen, or about two months’ wages for an average Mexican worker. So as far as the nation’s economy goes, crime doesn’t pay. Yet these figures actually represent an improvement on 2014, as a result of a decrease in violent crimes other than homicide. Last year, the increases in peacefulness not only reflected lower rates of violent crime, by 9.5 percent, but led to a tangible financial benefit with a reduction in the economic impact of violence of 96 billion pesos. The pace of progress has slowed, however, due to a sharp rise in the rate of homicides in 2015 of 6.3 percent. The increase in the number of murders contributed an additional impact of 31 billion pesos to the Mexican economy, increasing the total annual cost of homicide from 696 to 727 billion pesos. 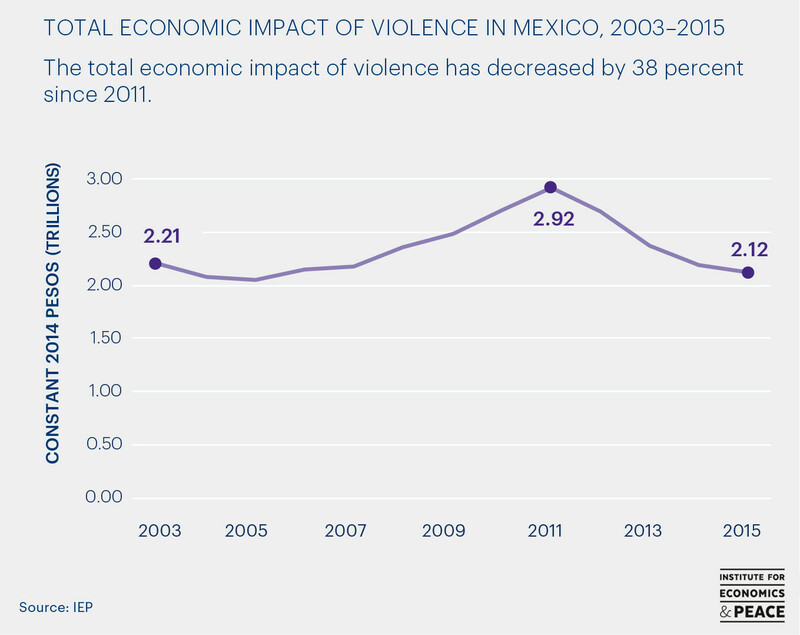 To identify the economic benefits that come from improvements in peacefulness, the Mexico Peace Index measures expenditures related to containing, preventing and dealing with the consequences of violence. It includes the direct and indirect costs of violence, as well as a multiplier effect to calculate the additional economic activity that would have accrued if the direct costs of violence had been avoided. Looking back, we can see that the economic impact of violence increased from 2007 until it reached a peak in 2011, at the height of the drug war, when it hit 2.92 trillion pesos, the equivalent to 19% of Mexican GDP. From then, peacefulness improved and with it came the rewards, with the cost of violence dropping by 38%, or 802 billion pesos, from 2011 to 2015. That represented an improvement close to one and a half times the total agricultural output of Mexico in 2015. The Mexican federal government’s expenditure on the military, domestic security and the justice system has steadily increased since 2003. In 2015, in constant currency, it spent 220 billion pesos or 1,818 pesos per Mexican citizen on keeping people safer. Military expenditure experienced the largest rise since 2003, tripling in constant currency terms in response to the rise in organized crime, and now representing 0.6% of GDP. Mexico has had success in lowering the activity of the cartels. The costs associated with organized-crime-related offenses improved for each of the last three years to 2015, with the cost of this group of crimes falling by 53%. Despite that, the economic impact of extortions and kidnapping on the Mexican economy was 10 billion pesos in 2015, which does not account for the very large economic impact of organized crime, such as deferred investment and consumption and the potential flight of capital, or include drug-trade related economic activity, such as the production, transport, trade, supply or possession of drugs. The Mexico Peace Index also calculates the indirect costs of violence, which are relatively high compared to direct costs. As an example, when a homicide is avoided, the direct costs, such as the money spent on medical treatment and a funeral, could be spent elsewhere. The economy also loses the lifetime income of the victim and the lost productivity of the pain and suffering of family and friends. The economic benefits from greater peace can therefore be significant. There is also strong evidence to suggest that violence and the fear of violence can fundamentally alter the incentives faced by business. Consequently, with greater levels of violence it is likely that we might expect lower levels of employment and economic productivity over the long-term, as the incentives discourage new employment creation and longer-term investment. Beyond that, violence also affects economic development, including reduced productivity on the job, decreased investment and saving, distortion of government resource allocation and the flight of human and financial capital. The positive news is that if the current five-year trend in peacefulness continues at the same rate in Mexico, not only will there be the human and societal benefits that come from a lowering of the levels of violence, but the economy is expected to save 5.66 trillion pesos (US$357 billion) over the next five years.